Child Portrait of a Prince, n.d.
Oil on canvas, 47 x 38 cm. 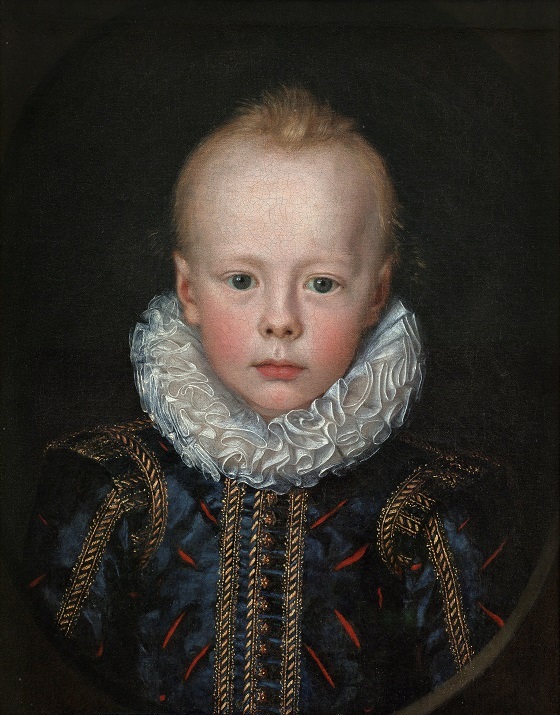 The sensitively executed child portrait probably shows the later Frederik III or his brother, Prince Christian. The painterly qualities such as the details of the dress, the puffed, feather-light collar and the gold brocade are characteristic of van Doordt’s popular court style. The boy’s facial features, the intense and serious gaze, as well as the playful hairstyle are painted by an artist with a great sense of detail and harmonious expression. The work has previously belonged to the great Golden Age portraitist, C.A. Jensen. Van Doordt was most likely born in Hamburg, Germany, where his workshop was located. For many years, he travelled for extended periods to work at numerous of the northern European courts, including the English, Danish and Swedish. Jacob van Doordt mastered the portrait genre in particular, both full figures and miniatures. He worked in Denmark several times between 1610 and 1626 at the court of Christian IV, where he carried out a number of portraits of the king and his family.